Carefully pruning to remove infected wood in combination with the use of agricultural antibiotics are the most effective means to manage fire blight. 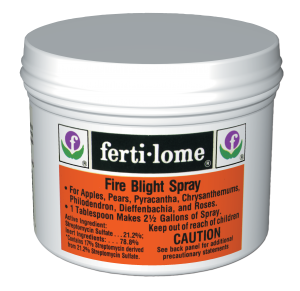 Streptomycin (Fertilome Fire Blight Spray) is available for homeowner use. Vigilant scouting for the disease combined with careful pruning techniques are recommended to manage fire blight in pear and apple trees. Fire blight can not only destroy the current season’s crop, but may damage the structure of the tree and reduce subsequent production. Highly susceptible trees may be killed in a single season. Fire blight symptoms are easily recognized by the scorched appearance of leaves, blossoms, and young terminal shoots. Initial infection causes wilt; infected tissue and tissue outward of infections turns black on pear and brown on apple. Blighted leaves remain attached to the tree through much of the dormant season. Infected ends of shoots (terminals) often exhibit a typical curling on the end, called a “shepherd’s crook”. Small droplets of bacterial ooze are a diagnostic sign of fire blight. This ooze is amber colored on infected leaves, flowers, and young terminals. 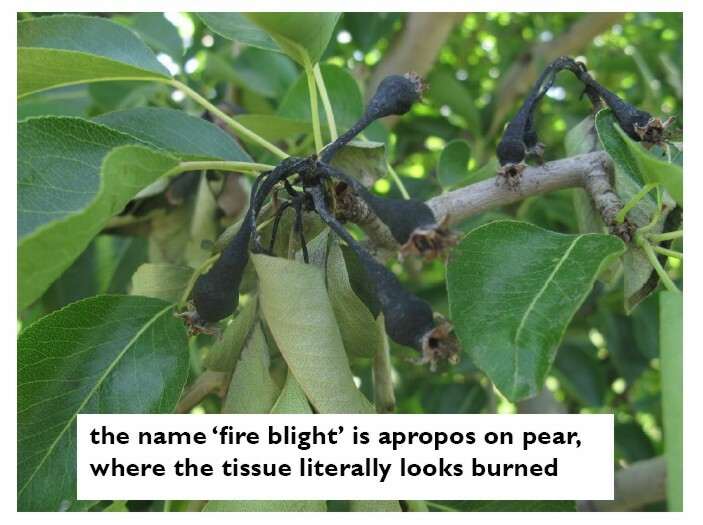 Pear trees are generally more susceptible to fire blight than apple trees. Infection of pear flowers or terminals may progress into larger branches and even into the trunk, causing death. 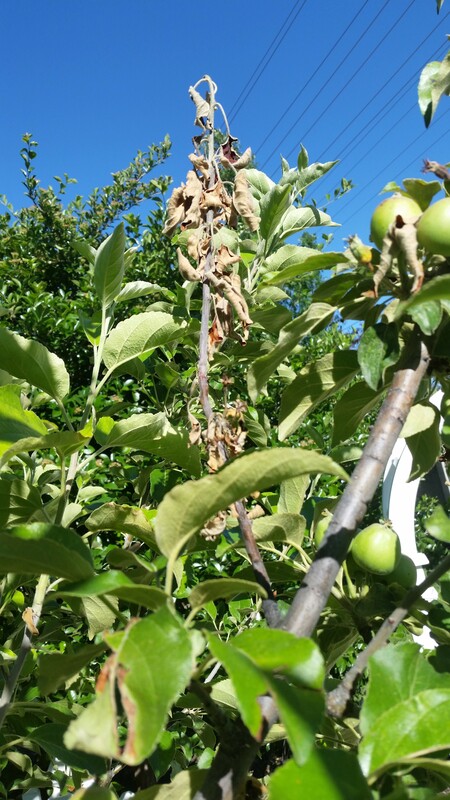 Apple infections usually result in death of flower clusters. 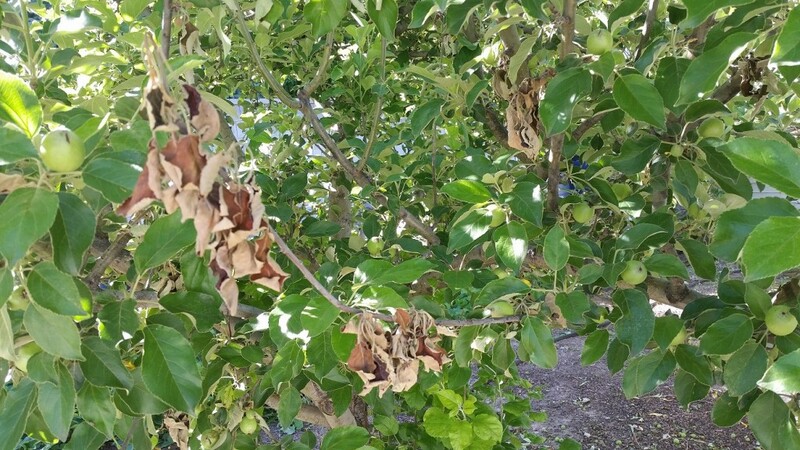 Fruit of either tree may also become infected, beginning with a brown firm rot that rapidly encompasses the entire fruit. Droplets of ooze are common on infected fruit. Fruit eventually shrivel and may remain attached through the winter. Bacterial cankers form when the infection progresses into woody tissue. Cankers are slightly sunken areas with discoloration of the bark. Fire blight can survive in other hosts such as pyracantha, hawthorn, cotoneaster, mountain ash, and crabapple that may be growing near the orchard. Any practice that promotes excessive succulent growth should be avoided. Trees should be fertilized to promote good health, but overfertilization with nitrogen or applications late in the season often cause excessive new growth that is susceptible to fire blight infection. Remove blighted blossoms and twigs as soon as they are evident. The infected blossoms and twigs should be pruned a minimum of 8 – 12 inches below the obvious infection. Avoid heavy pruning in the early summer because it stimulates succulent growth, which is very susceptible to blight. During the dormant season, remove any cankers or blighted tissue. Also, remove any suckers growing up from the roots or on the trunk. It is advisable to avoid using pruners on small twigs; use hands to break out the blighted twigs. Pruners should be soaked in a 10% solution (1 part bleach: 9 parts water) of household bleach, or good surface disinfectant, between cuts when pruning out active fire blight in the summer. Bleach solution is effective but is corrosive to pruning tools. Rinse, dry, and oil the tools several times during the pruning. Pruners need not be sterilized between cuts when pruning during the dormant season. Avoid excessive irrigation to reduce humidity in the orchard. If using sprinkler irrigation, do not allow the water to wet the foliage since it will act in the same manner as rain in spreading bacteria. No cultivars are completely resistant to fire blight, but some are less susceptible than others. If fire blight is a common problem in your area, plant less susceptible varieties. In orchards with a history of severe fire blight, it is advisable to carefully prune out overwintering cankers and spray with a copper-plus-oil mixture at the delayed dormant stage (silver tip to green tip). Copper compounds can be phytotoxic if they are sprayed much past the bud burst stage (1/2 inch green). This spray is thought to reduce the levels of inoculum in the orchard, but may also be effective in reducing insects that spread the disease. 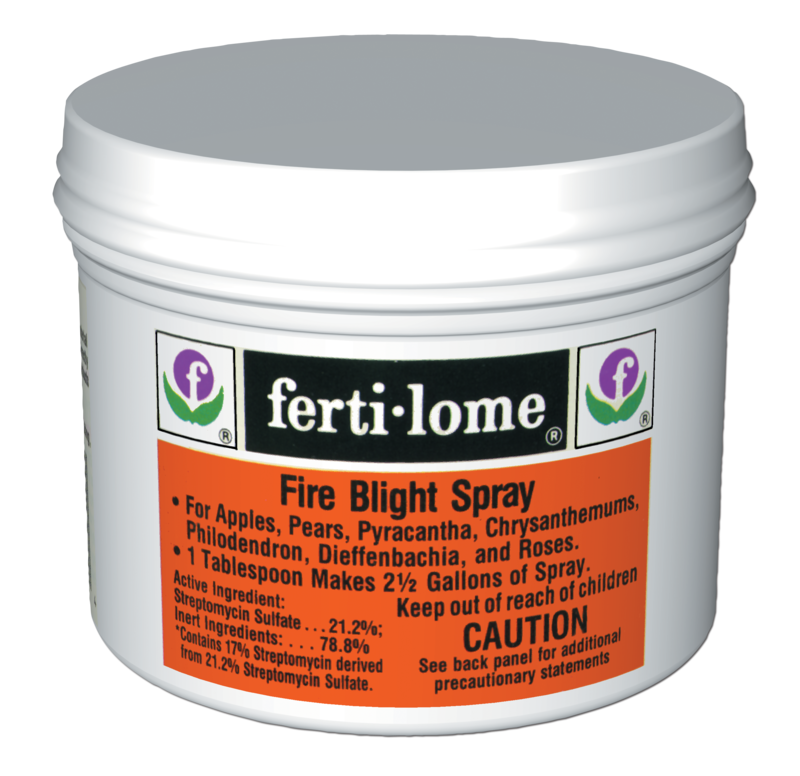 Streptomycin has proven very effective in reducing fire blight provided it is properly applied while the trees are in bloom. They are preventive sprays only and must be repeated every 4 to 5 days as long as new flowers are opening. Always read the label and be familiar with the product’s intended uses and limitations. Never use a chemical pesticide in a manner that is inconsistent with its labeled instructions, it is a violation of federal law.